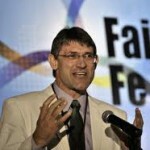 Christo Greyling is World Vision’s Director: Faith Partnerships for Development. He holds a post graduate degree in theology from the University of Stellenbosch and a master’s degree in Public Heath from the Medical University of Southern Africa. He was responsible for the development of the Channels of Hope methodology which he was instrumental in developing before joining World Vision in 2002. The Channels of Hope program is a transformative process which catalyze faith leaders and local faith communities to engage on the world’s most difficult issues such as HIV, gender, child protection, maternal and new-born child health and Ebola. Channels of Hope received the Babson’s College’s Lewis Institute 2015 Social Innovator Award. Christo is passionate about the role of local faith communities in development and is leading a team of practitioners to scale-up the different CoH models across the world. By end of 2014 410,000 faith leaders has attended 18,000 CoH workshops in 51 countries.